The tema or kapkap are flat, round breast plates or disks made and worn as men’s chest or forehead ornament in the Solomon Islands. Tema is one of my favourite ornaments from the Melanesian region. Tema from Malaita. Public domain image. I particularly like the tema because of its spiritual meaning, its stunning appearance and temas take a long time to make, by hand. 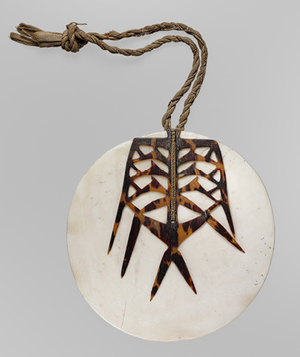 A A tema in the Melanesian culture is regarded as a spiritual object. They are worn as a protective shield during tribal warfare and for general well-being. The white part of the tema represents the moon. It is made from the giant clam shell. 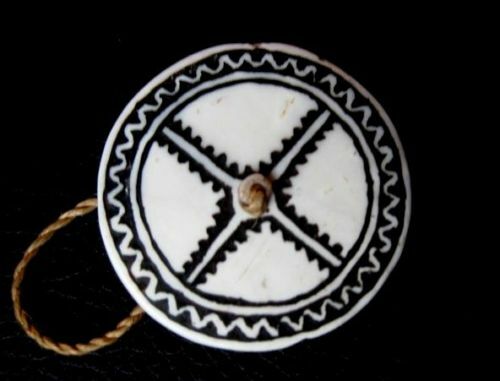 In the Santa Crus Islands, the traditional symbol of the frigate bird, shark or dolphin is intricately carved out of the turtle shell and embedded or attached to the clam shell base. The brown necklace is made from bark and bush ropes. http://www.victoriaginn.com/solomon-islands Photographer Victoria Ginn. 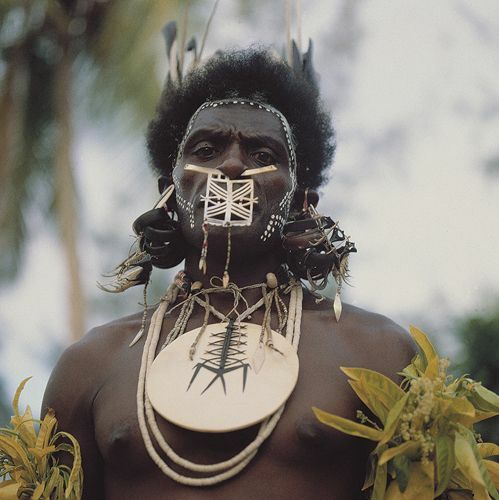 Malaita man dressed with his tema. Previous PostSaved Duck Returns With BabiesNext PostLove Is.. Very beautiful items. It’s amazing what can be made from such things as clam shells. The designs on them are lovely, too. Your Tema image reminds me of the moon with two snakes intertwined. He must be a healer! Thank you very much for sharing Rika. Lovely to see you here. I don’t know to be honest. He may well be. 🙂 We are of many tribal groups, languages and customs in the Melanesia. I am happy to ask for you, but it may take some time to find out.